I use public transportation to commute all the time. I decided instead of listening to exclusively music (even though I will always adore it (especially Chance the Rapper)) while riding the subway, that I would try to listen to some podcasts to learn some new things about the world. Here are some podcasts I've been listening to, and that I enjoy! My Favorite Murder. 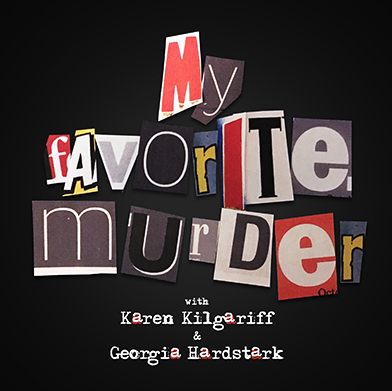 Karen Kilgariff and Georgie Hardstark are true crime enthusiasts and love to research some awful things that have happened to people. They review different crime stories (solved and cold cases) that have occurred throughout the world. One of my favorite features of the podcast is the incorporation of the audience by asking them to submit hometown crime stories, which really personalizes these narratives of crime in the world. There have been wild criminal activities that they discuss, many of them I haven't heard of before. Sometimes I think it's a little insensitive, but for the most part, I learn a lot and it is incredibly entertaining. Favorite Episode: Nineteen Kills and Counting. The women explore the Norwegian murderer Anders Behring Breivik, and his absurd scheme that sent him to an island and targeted youth in a summer camp after bombing the City of Oslo. This episode, I think, is my favorite just because humans are capable of some of the most egregious things. I also think that they do a good job of depicting Norway as a peaceful place, and that crime like this is unheard of. Modern Love. This podcast is a medium of unraveling the human conditions and just how odd and weird we really are. Meghna Chakrabarti hears the narratives of different people in various relationships. Notable personalities read stories that individuals have written about themselves and then Chakrabarti speaks to the author of the stories to hear updates about those relationships, as well as in their life. Some stories are tearjerking, some show that you can find love in many people, whether it is romantic or platonic. Humans are so weird, and I don't understand why we work the way we do, but I managed to see forgiveness and love in a completely different perspective. Favorite Episode: The Doorman. I very briefly dated this guy who had such an affinity for his doorman. He would talk about him and his eyes would light up, he would go out of his way to please his doorman and he really respected this guy. I never understood why he cared so much until I listened to this episode. It was about a woman who got randomly pregnant and how she developed a platonic relationship with her doorman. He was concerned for her, and cared about her and her child. It's a relationship that isn't discussed much but doormen and residents have some sort of unspoken and unlabeled relationship, and she delves into what it means. Another Round. Tracy Clayton and Heben Nigatu are two black women who interrogate racism, sexism, politics, drinks, etc. They have incredible people featured on the show including Ta-Nehisi Coates and Dr. Adrienne Keene. They make me laugh and are down-to-Earth women who are very clearly best friends and their dynamic truly shows it. I learn so much every time I listen to the show, and I really can't get enough of them. Favorite Episode: Challenging & Unpredictable (With Melissa Harris-Perry). This episode was fascinating because it gives Melissa Harris-Perry's personal account of what happened with her relationship with MSNBC. Clayton and Nigatu ask insightful questions and draw so many implications from how MSNBC responded to Harris-Perry and her creative control over The Melissa Harris-Perry Show. Honestly, these women are journalists and truth-finders and I think this episode really speaks to that.